This title has been a pretty enjoyable Legacy sojourn (ooh la la!) as our terrific trio have been trying to establish a nice equilibrium. 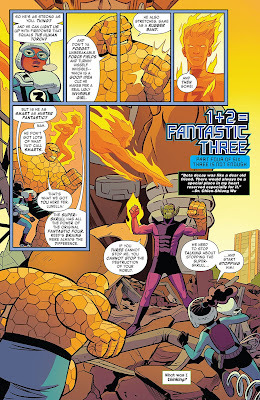 Okay so maybe they have had a few cosmic catastrophes thrown at them along the way but its been kind neat hanging out with this crew on Yancy Street. Will the fun continue this issue? Let's see. Okay, so this issue sees the trio face off against Super-Skrull, and while that aspect of this issue is kinda fun, it fails to see any resolution as Super-Skrull appears to get scared off by an intervention from Silver Surfer. That's fun and all but actually Super-Skrull has run off to Omnipotentis (the real big bad) and she plans on coming to Yancy Street to lay down some real problems for our heroes. The trouble with this issue was that it didn't quite know what to settle on as the heart of the issue. It was part battle against Super-Skrull, part lead into Omnipotentis, part enlist Silver Surfer and Galactus against the big bad, part Fantastic Three cast around for missing fourth hero to fill Sue Storm's boots. The art in this issue was as good as always, and yet again full marks go to Tamra Bonvillian for her work on colors. This whole issue seems to shine in some sun-kissed golden honey glow. 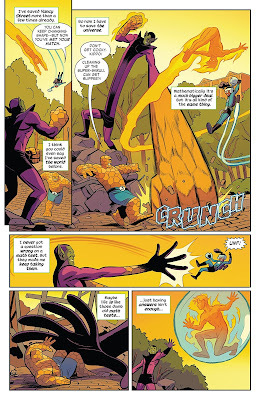 Galactus looks pretty amazing stomping through NYC. 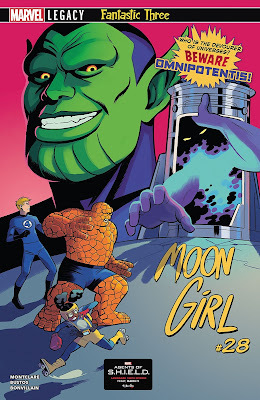 Likewise Bustos compliments some of the jokes between Silver Surfer and Moon Girl very well in the dialogue within the pages following the initial battle with Super-Skrull. All in all this was a bit of a bridging issue and its the first time since Legacy that I have felt this storyline starting to drag a little. 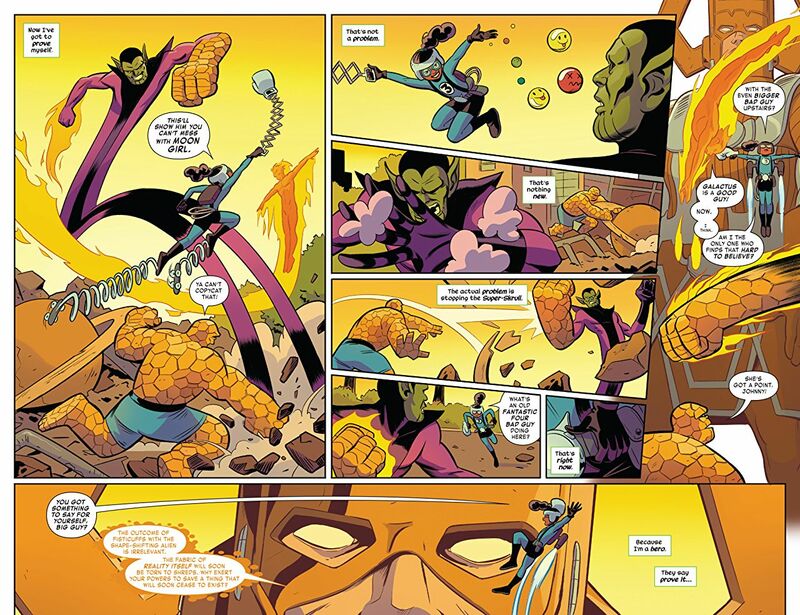 It seems to me that the battle with Super-Skrull wasn't strictly necessary, and that showing his behind the scenes machinations may have been a better use of this issue's time. Alternatively just give us the battle and leave a little mystery about what he was up to. Anyway, no-ones payin' me to be a script doctor over here so Marvel will just have to figure it out for themselves. A pretty routine issue, but I figure I can allow this one to pass given how much I have enjoyed the post-Legacy run on this title. 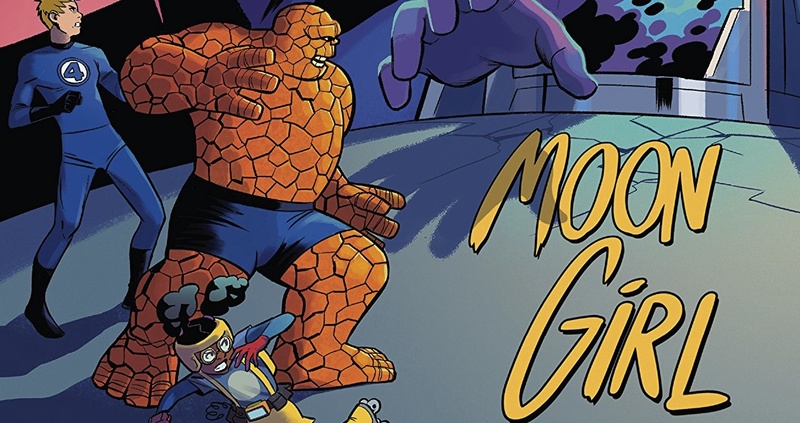 As always the book is a delight to look at and Bonvillain's colors continue to compliment Bustos' art perfectly. Story needs to pick up again soon though and the bulk of my 6.5 score this issue is attributable to the art.